I guess Ed and I should have gone to Vietnam later in the year, because on December 6, 2007 American Michael David Magidson became the 4 millionth international visitor to Vietnam in 2007. Apparently, the American guest looked moved and happy for his coincidence. I would have been positively thrilled! Ever since we traveled to Vietnam in March 2007, I’ve been thinking about going back. The Vietnamese people are oh so kind and gentle. Can you imagine the result of crossing a street in Canada or the U.S. where hundreds of motorcycles (scooters) are coming at you full-speed? You’d be mowed down without mercy for having been ‘so stupid’. 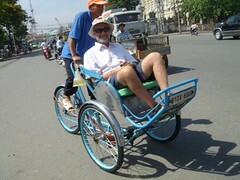 In Vietnam however, provided you move at a steady even pace, all the drivers simply give way and go around. Can you imagine a hotel front desk clerk greeting you by name the second time she sees you at any large hotel in North America? That’s what happened to me in Ho Chi Mihn City and I just about fell over from shock. The food… well, what can I say other than I’ve waxed poetic about having pho for breakfast a couple of times already and I haven’t even started to talk about the vermicelli and spring rolls. Delicious! Anyway, I’m thrilled to hear that tourism in Vietnam is increasing. Overall travel to Vietnam was up 6.7% year-on-year and this year Vietnam targeted 4-4.4 million foreign visitors and 19-20 million domestic tourists with total revenue amounting to VND56 trillion, or US$3.5 billion compared to nearly US$2.9 billion of 2006.